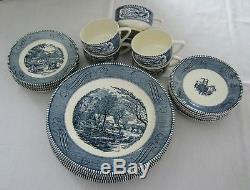 Vintage Currier & Ives Blue and White china dishes, dinnerware set for 6 Made in USA EC. Gorgeous service for six (6). Included are the following 24 pieces: Six (6) 10 dinner plates (backstamped). Depicting "The Old Grist Mill", a Currier & Ives print by Royal. Six (6) 6 ¼ salad plates, six (6) cups and six (6) 6 saucers (backstamped). Depicting "Low Water in the Mississippi", a Currier & Ives print by Royal. The condition is excellent with no chips or cracks. Thank you for looking at our listing. We promise to keep you informed, to listen to your concerns and solve problems. Descriptions You Can Rely On. You wont see a lot of fluff in our descriptions. We try to communicate what you need to know with accurate words and high quality photos. The photos are considered part of our descriptions with nothing to hide. If you notice something and have questions, please do not hesitate to ask. We want every customer, as a satisfied customer. We use top quality packing materials-mostly new boxes and new or clean recycled Styrofoam peanuts and bubble wrap. When necessary, we double box items for extra protection. 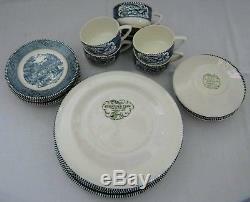 The item "VTG Currier & Ives Blue and White china 24 pc dinnerware set for 6 Made in USA" is in sale since Sunday, August 12, 2018. This item is in the category "Pottery & Glass\Pottery & China\China & Dinnerware\Royal China". The seller is "queen_of_garage_sales" and is located in Lakeland, Florida. This item can be shipped to United States.